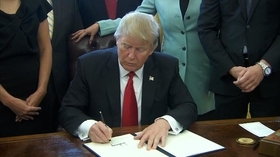 Healthcare industry stakeholders are lauding President Donald Trump's latest executive order, which requires executive departments or agencies to remove at least two previously implemented regulations for every new one issued. The order could have major ramifications for healthcare, one of the most regulated industries in the U.S. economy. Providers and vendors face a myriad of rules drafted by numerous agencies and departments, including the CMS, the Health Resources and Services Administration, the Food and Drug Administration and the Office of the National Coordinator for Health Information Technology. There are dozens of regulations imposed against the healthcare industry every year and almost all of them carry some cost burden. The rules and regulations include licensing requirements; quality and safety inspections; and standards to adhere to payment policies. Among the major ones released last year: a rule that mandated the medical loss ratio for managed-care plans and also overhauled how the plans are overseen by the CMS; a ban on discrimination at federally funded hospitals, physician practices and clinics; a rule that allowed claims data to be sold; and a rule on the new payment models outlined in the Medicare Access and CHIP Reauthorization Act, known as MACRA. The order could also have an impact on implementation of the recently passed 21st Century Cures Act, which requires the FDA to make significant changes to its review processes and policies to speed up the drug development process. Regulations that deal with internal agency processes are exempt from the order, but there are other parts of the Cures Act that could potentially be impacted, including major provisions intended to improve mental healthcare and opioid addiction treatment. Rick Pollack, CEO of the American Hospital Association, released a statement Monday heralding the order, saying it reduces bureaucracy. He noted that last year alone, the federal government added 23,531 pages to existing regulations affecting hospitals and health systems. Pollack said reduced regulations will lead to lower costs and less paperwork for healthcare professionals. Scott Whitaker, CEO of the Advanced Medical Technology Association, said his organization is still reviewing the executive order. The group lobbies on behalf of devicemakers. Amit Sarang, a regulatory policy advocate at watchdog Public Citizen, said the rule may be problematic for providers and vendors who have invested significantly in adjusting their businesses around new or upcoming regulations. "We don't know which of these healthcare regulations that the healthcare industry has already complied with and sunk costs into are going to have to be repealed in order to allow for expected regulations," Sarang said. Trump's order ostensibly drops the fiscal 2017 regulatory budget to zero. Under the new order, the White House will also set an annual cap on the cost of new regulations. For the rest of fiscal 2017, the cap will require that the cost of any additional regulations be completely offset by undoing existing rules. The executive order appears to allow the director of the Office of Management and Budget to exempt any regulations he or she may see fit. Trump's OMB nominee, U.S. Rep. Mick Mulvaney (R-S.C.), hasn't yet been confirmed. Pre-defined exemptions include those dealing with the military, national security and foreign affairs, or any regulation related to agency organization, management or personnel. The order says that the new OMB director will issue guidance on implementing the order, including instructions on standardizing how regulatory costs are measured and standards for determining what qualifies as new and offsetting regulations. It suggests the director consider implementing the requirements in phases. The new executive order will multiply the work of regulators who now must spend significant time looking for rules to gut in order to pass new ones, Sarang said, noting that the process for repealing rules is just as lengthy as the process for proposing them. "The federal workforce, the rulemaking staff, will now have to devote all of their attention to getting rid of rules mostly," Sarang said. "That will certainly be costly." When asked whether the executive order would apply to FDA guidance, a spokeswoman at the agency referred comment to the White House. A request for comment wasn't immediately returned by the White House. Guidance is the main channel through which the FDA, CMS and many other HHS agencies issue directives to the industry, and those documents don't go through the Office of Management and Budget, said Ankur Goel, a health law partner at McDermott Will & Emery. In most cases, guidance documents aren't considered rules, so Goel expects that those actions would fall outside of the scope of this executive order. Goel doesn't believe the order will have an immediate impact on the healthcare industry, and expects that much of it will be interpreted and clarified by the government and industry at a later date. “It's a statement of policy … it's not attempting to deal with all the complexity,” Goel said. The “one-in, two-out” approach has been tossed around for several years, but it hasn't been adopted because many believe it's not a well-targeted approach to reducing regulatory burden, said Michael Livermore, a University of Virginia law professor who specializes in regulation and cost-benefit analysis. It maintains the status quo, which isn't necessarily something a new administration wants to do. The United Kingdom has a "one-in, two-out" rule that applies specifically to legislation that will increase costs for businesses and not-for-profits. The rule requires policymakers to remove or modify existing regulations to the value of £2 of savings for every pound of cost imposed. Canada has a "one-for-one rule" that requires rulemakers to remove a regulation for every new regulation that imposes an “administrative burden on business.” The Canadian government says 19 regulations have been taken off the books, resulting in over $22 million in reduced administrative costs for businesses, and the elimination of an estimated 290,000 hours a year that would have been spent in dealing with regulations. But Trump's order will be unworkable in practice and might not have any teeth, Livermore predicted. That's not uncommon with executive orders in the U.S., he said, pointing to a rule that President Bill Clinton issued that limited regulations that would have an effect on state and local policies. In the end, it was too expensive and difficult for agencies to determine the impact of their rules on municipal and state governments, he said. Livermore wondered why the Trump administration would implement an order that could limit the ability of its own cabinet to put rules in place. Most regulations are being issued by agencies because they've been ordered to do so by congressional legislation, like the 21st Century Cures Act or the Affordable Care Act, said Sean Moulton, manager of the Open Government Program at the Project on Government Oversight. Many agencies are in the process of drafting rules for laws that have recently gone into effect, but as it's written today, this order doesn't change the requirements placed upon them.